This topic describes the KOA Stats Analyser and its online brother, the Statistics Institute, two excellent pieces of software developed by Spyros Paraschis (Abyss). Every game of an official Kick Off tournament is recorded in the KOA Tournaments Database. The KOA Stats Analyser uses this database and presents all the tournaments in a comprehensive way. It also offers a great variety of statistics. The Statistics Institute is an online presentation of the most important features of the KOA Tournaments Database. The KOA Stats Analyser (previously known as KOA Tournaments Database Viewer) is an application that reads the KOA Tournaments database, maintained by Alkis, and presents a huge amount a statistics. So, if you are even remotely interested in statistics like who has the 3rd best defense or what are the results between Martin J and Robert S or what is the ranking progress of Nikos A or what is Nazim's best scoring record or who are the best players from Italy or even what are the predicted results of a tourney with Steve C, Klaus Lo, Vasilis K and Mark P, the KOA Stats Analyser is a must download. For any installation / operation problems I will keep a small FAQ and I will update it with all questions asked. Please keep in mid that some posts in this topic may be deleted (after moving the relevant questions in the FAQ) to keep the topic clear and easy to follow. 1. I downloaded the app. Is this the only thing I need to do to see the stats? The KOA Stats Analyser needs the KOATDB, maintained by Alkis. After downloading and installing the Analyser for the first time, you also need to download the latest version of the KOATDB, extract it in a folder and then run the Analyser. It will ask you to locate the KOATDB.mdb file. 2. How do I update the program and the database? In the beginning of a month, Alkis will update the KOATDB and will post here to give you the download link. If any updates to the program are required, the archive Alkis posts will also contain the latest version of the application executable. All you have to do is unzip everything to the Analyser directory and overwrite any existing files while doing so. The Analyser should not be running for the update to work. 3. Are there any other requirements for running the analyser? This error is usually caused by trying to read an Access database in a system with no multilanguage support. Install multilanguage support to solve it. In older versions there is a mistake in the average calculation of some stats (for example the Team B average goals scored) in the Player Stats screen. This has been corrected in v1.1. You can sort the stats of all players based on Goal and Defensive averages - just go to the Misc Stats, select for example "Best Defense Avg" from the "individual stats" section and click on the "List All" button. 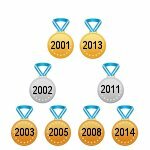 The ranking points are updated on a monthly basis, so for example the May 2003 rankings will be calculated for all tournaments held till April 30, 2003. If you play a tournament in May, the results will be reflected on the June rankings. You won't appear in the rankings until you have played 2 tournaments. The reason for this is that we have about 40 players out of the 80 that have just played a single tournament and these all sit in a cluster around 1000 pts and distort the ranking. We made the decision that they are not 'active' players until they play 2 tournaments. Think of it in terms of going 'pro' on your second tournament! However, the ranking points of those "inactive" players are still calculated and can be displayed in the ranking table of the Analyser (by unchecking the "Ranking table tournament participation limit" checkbox in the options). If however a player participates in his first tournament, his name will be included in the player lists of all the statistics categories after the next ranking update. 9. I get a runtime error when running the application. Any possible fixes? This can happen when you match a version of the application with an earlier (or later) version of the DB. What happens in this case is that the app is looking for some specific fields/tables that do not exist. If this is the cause, deleting the ini file and selecting the new version of the db will solve the problem. Keep in mind that whenever an application update is needed for a new db version, the application is included in the db update archive. In order to see difference in your points (other than the small percentage by which you automatically approach 1000 every month), you have to look at months between which you have played a tournament. For instance, you played in the World Cup and Kitchen II in November, and Kitchen III in December. Losing points does not necessarily mean you move down (and vice versa), it obviously depends on what the other people around you do. Anyway, the best way to track your progress in the Rankings is going to Player Stats-> Mark W-> Progress. On tournaments, this is normal, because leagues are sorted by the results of the player in their games vs each other and then by gd. On the fantasy league, this was corrected in v1.4a. 15. Does the application run on Windows Vista? Yes. However, you have to run it as administrator - normally Programs are run with User-privileges under Vista. Right-click on koastats.exe (or its shortcut) and choose "Run as Administrator" (thanks Sascha). The KOASI has been updated. DO NOT request a recalculation.